I have a new appreciation for Friday’s – not the week day, the restaurant. And I have Disney World to thank for my new perspective. I spent 3 magical days in Disney World with my brother, sister-in-law, parents, two nieces (ages 6 and 3) and 850,000 other people. I’m not sure how the other 850,000 people felt but I saw Disney make dreams come true. My 3-year-old niece nearly passed out with excitement when she met Princess Aurora (Aurora, I thought was a new princess but she’s Sleeping Beauty. Who knew Sleeping Beauty had a name?) And her mother misted up, so touched by her daughter’s glow that she nearly cried. The 6-year-old got to meet Tigger (or Titi as she’s called him since 18 months old when she made a Tigger plush toy her special and always lovie). She got to tell Tigger how much she loves him and Tigger swooned with delight, held his hands to his heart and hugged her. The Titi meeting was as emotional for parents and grandparents (and me, the Aunt) as it was for my niece. But there’s a challenge inherent in any Disney visit. One must navigate travel and lines and fast passes and stroller parking areas and do it all at a pace that keeps the kids excited, keeps restlessness from setting in so one niece doesn’t think kicking her sister is a good way to fill the lull. You have to deal with not-so-good food, stroller wheels running up the back of your ankle and the stress of wanting the kids to see everything but not being quite sure how to make that happen. And you have to do it without a single cocktail because The Magic Kingdom is dry. I already mentioned the 850,000 other people and stroller parking so you’re probably thinking a bar is the last thing the Magic Kingdom needs. I don’t want to add “sloppy drunks” to the list of challenges at Disney, but that first day, after waking at 3AM to fly from New York to Orlando and hit the Magic Kingdom at prime line time, getting an afternoon margarita pause would have made my dreams come true. Enter TGI Friday’s in Lake Bueno Vista, FL. We left Disney after dark, the soles worn off our shoes and our energy sapped. We walked into TGI Friday’s and even though I expected a heart wrenching example of mix abuse, I ordered a margarita. And not just any margarita, I went way out and ordered the Ultimate Margarita. It came in a glass the size of a fish tank so I had to sit way up to reach the top and take a sip. And that first sip brought sweet surprise. It was good. And I was grateful. My experience could have been the result of the moment, and quality may vary from one franchise to another. But if you’re ever getting off of Route 4 at Lake Bueno Vista after a long Disney day, think about the TGI Friday’s in the Cross Roads Mall. 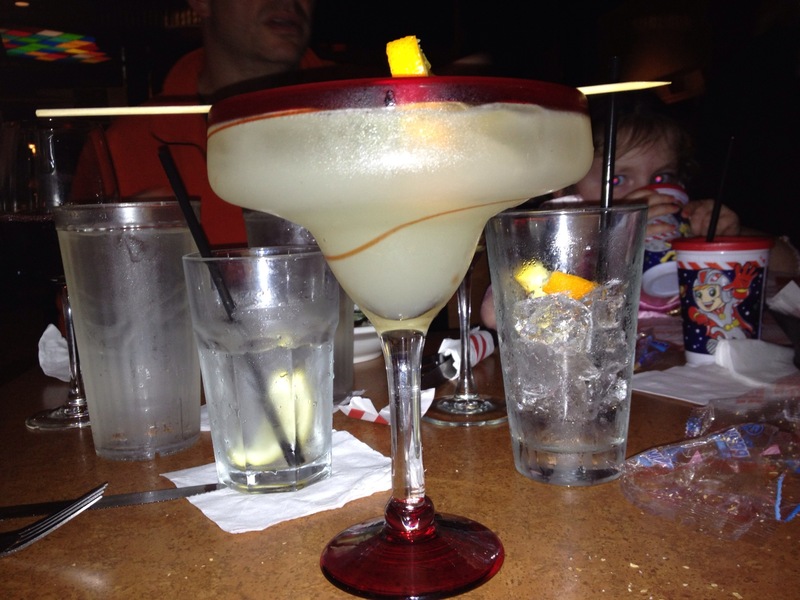 They are kid-friendly, the margarita was good and they could see into my soul – the TGI Friday’s website says, “Sometimes, you’ve just gotta have your favorite drink.” They couldn’t have been more right. One more tip – if you have the chance to go to Disney World with your beautiful nieces, don’t pass it up. You will never forget their laughter, smiles and the magic reflected in their eyes.